Maybe a bit inspired by the mass effect game again. But it was more the opening sequence of wing commander III. There was this huge spaceship crashed into the sea and the name of the place was ‘mistral’. 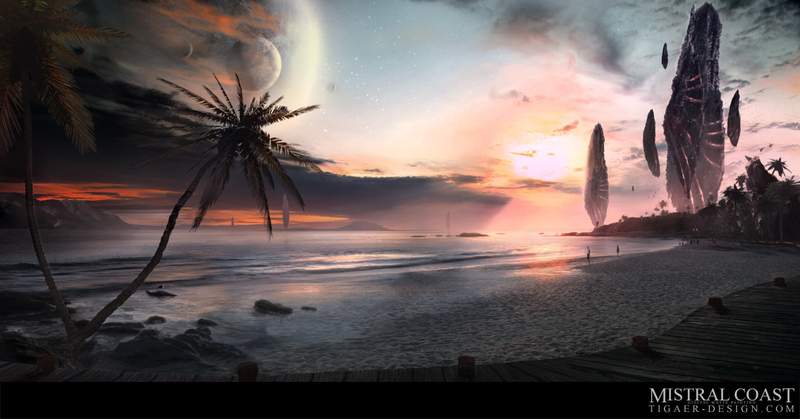 I always liked that name and the idea of a beach scene on another planet. Technically i worked with digital matte painting techniques to get it done. I wanted to have a photoreal look for it. I did not do a photoreal painting in a while… so i wanted to have something done again. Stocks used for the beach, own photo material used for other elements. The monoliths and some vegetation done with vue. All combined in photoshop. I took myself some with this one so the work took place over a period of two months. Maybe 40hrs of work in it. This entry was posted on Wednesday, October 1st, 2008 at 20:53	and is filed under Paintings. You can follow any responses to this entry through the RSS 2.0 feed. You can leave a response, or trackback from your own site. Absolutely beautiful work, very nicely done. Works like that have very special atmosphere… making me speechless.